I always laugh to myself when people say “grocery store flowers” – like they’re the less desirable step-cousins of “true flowers” and to assemble a decent looking arrangement with them is a major feat. Aside from a rare, delivered arrangement from someone else, I work exclusively with “grocery store flowers”. It’s what’s accessible and I *think* I’m in the majority on that. Most of the time, I hit the store blindly, coming up with centerpiece ideas on the spot, based on what’s available. True, not all grocery store floral sections are created equal and I cringe every time I walk into our nearest store (not naming names 😉 ) to see the same, over-dyed daisies and mums, but you should never feel like you’re at a disadvantage to create something spectacular, just because you do “grocery store flowers”. One of the easiest ways to expand your floral centerpiece possibilities is to add other elements – edible elements – to your arrangements. Start looking at the fruit and produce area as your floral department part II. 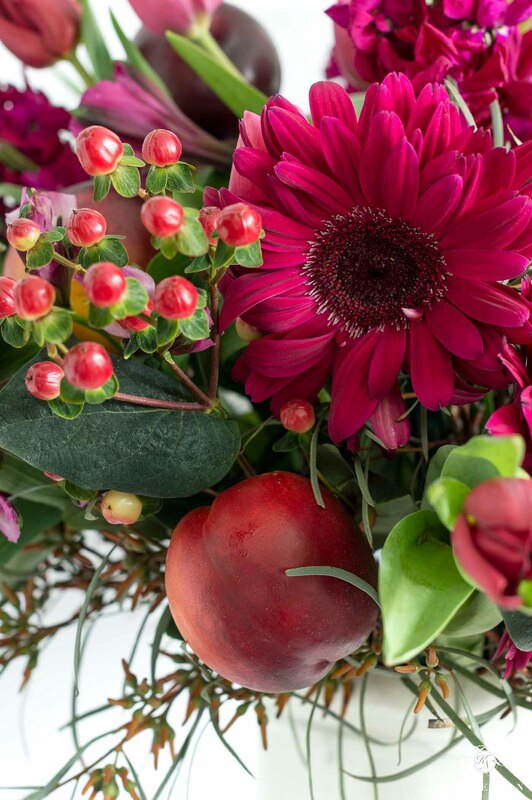 This past weekend, I headed to Trader Joe’s (the best grocery store flower spot I know – and yes, I drive an hour each way to get there) and in less than 30 minutes, I came up with six different fruit and flower arrangements with combinations to create stunning centerpieces. I went in with peonies in mind… they were out. I knew I wanted silver dollar eucalyptus that they always have in stock… they didn’t. White lilies are my go-to… there were none to be found. Bottom line, it didn’t matter. I went with what they had and worked to be creative. [Tip: I rarely ever go for pre-arranged bouquets. They are typically more expensive and always have stems I don’t care for mixed in. I would rather get several small bundles for a few bucks each than spend on something already assembled. You can usually get more mileage this way too, across several arrangements 😉 ] Even if all you find are some hydrangeas, thinking of your produce aisle as a flower department extension will make for so many more possibilities. As an FYI, I will buy way more flowers at Trader Joe’s than I would our other grocery stores because 1. they always have better variety, and 2. they are a fraction of the price. Costco is another favorite, even though they don’t have quite as much diversity 😉 And you can create some killer bouquets with the Publix three-bunches-for-$12 area. The six arrangement ideas I’m sharing today are good for any market or grocery store you frequent, though. The most important thing is to be flexible and open to what you might find. 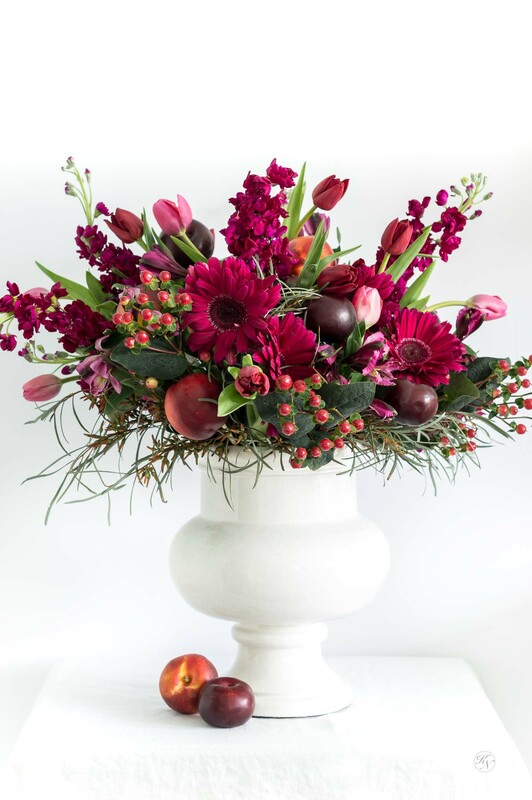 I can usually get away with not using floral foam for most of my typical arrangements but when you bring fruit into the mix, you will likely need to use a sturdy foam at the bottom of your vessel that can support wooden skewers. I use THIS WET FLORAL FOAM and THESE WOODEN GRILLING SKEWERS to pierce the fruit. The pointed end goes into the fruit and the blunt end into the foam – you can even break them down shorter if you need to. 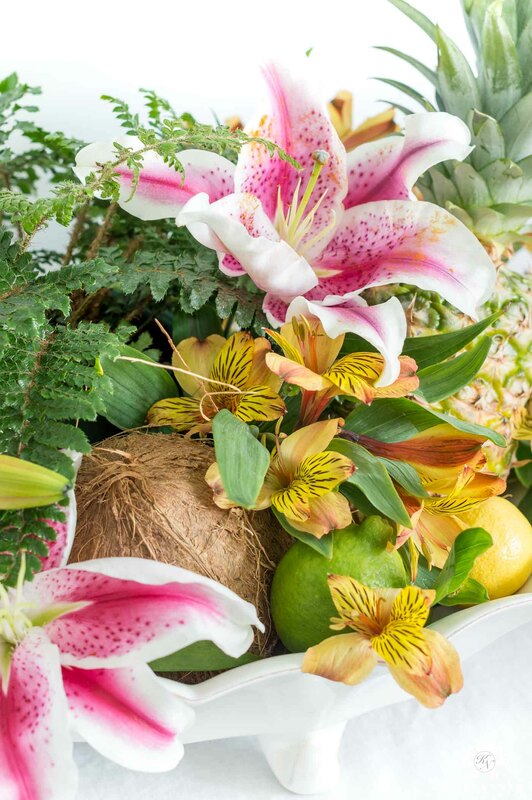 To construct the fruit and flower arrangements, I start with greenery as a base (if I’m using it), then the largest flowers to stagger around the foam, then smaller flowers, and lastly the fruit skewers. This first arrangement is the simplest (and least expensive) of all. 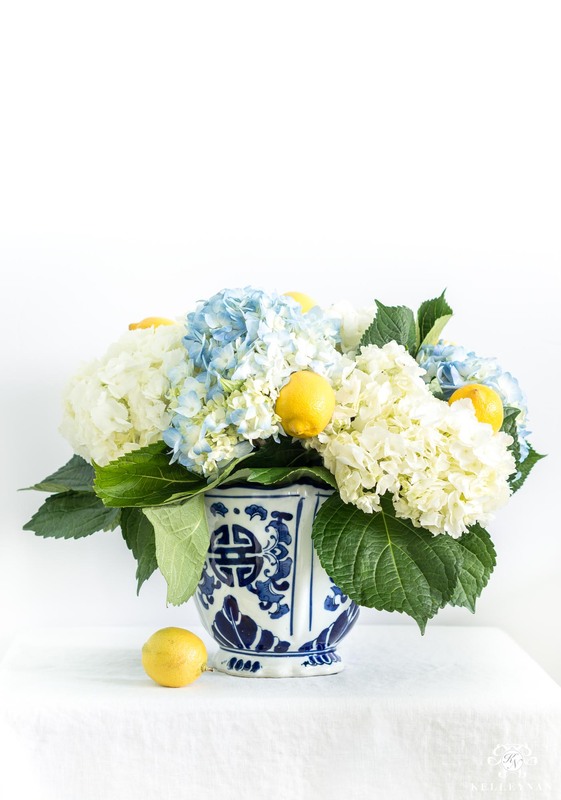 Using only five blue and white hydrangea blooms, and a few lemons, I upped the “wow” factor using my favorite color combo. If you shop at Trader Joe’s, you can probably get the flowers and the fruit for under $10 total. I love the look of tone on tone florals so you will notice that as a common theme throughout the fruit and flower arrangements I assembled 😉 I started this jewel-toned centerpiece with some greenery at the base before coming in with red gerbera daisies, fuchsia stock, purple alstroemeria, and pink and red tulips. I then added skewered plums and nectarines before finishing it off with few scattered berries. Flowers that boast sizable leaves will also help fill out the arrangements and aid in hiding the wooden skewers. 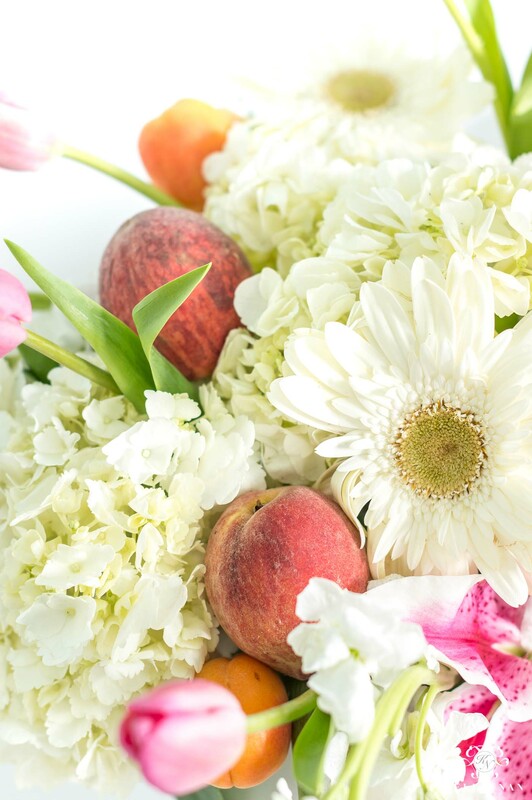 Before I went to the grocery store, I was hopeful to pair peonies and hydrangeas with peaches. Instead, I adapted and came up with a Plan B- hydrangeas, white stock, white gerbera daisies, and pink tulips. I had two surviving pink lilies that I threw it at the last minute 😉 In addition to the peaches, I added in some small apricots. 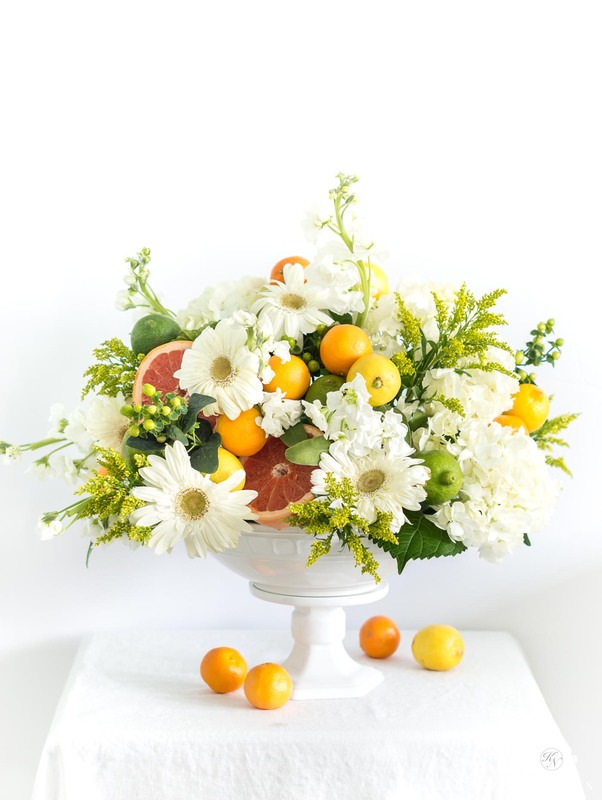 I think the citrus arrangement may be my favorite of the six. I also used fewer flowers and way more fruit for this centerpiece (both in variety and quantity). I used a footed bowl for this vessel (a perk of using floral foam) which helped create an extra strong base. Here’s how I pulled it together- I first added white hydrangeas, white stock, and white gerbera daisies. At this point, the arrangement was still really sparse. I then added two halves of a sliced grapefruit and came back in with skewered lemons, limes, and miniature nectarines/oranges. I have no idea what the yellow stuff is called (found next to other filler at TJ’s) but I made room for a few sprigs and then topped it off with some green berry branches. This arrangement is a bit different from the others. 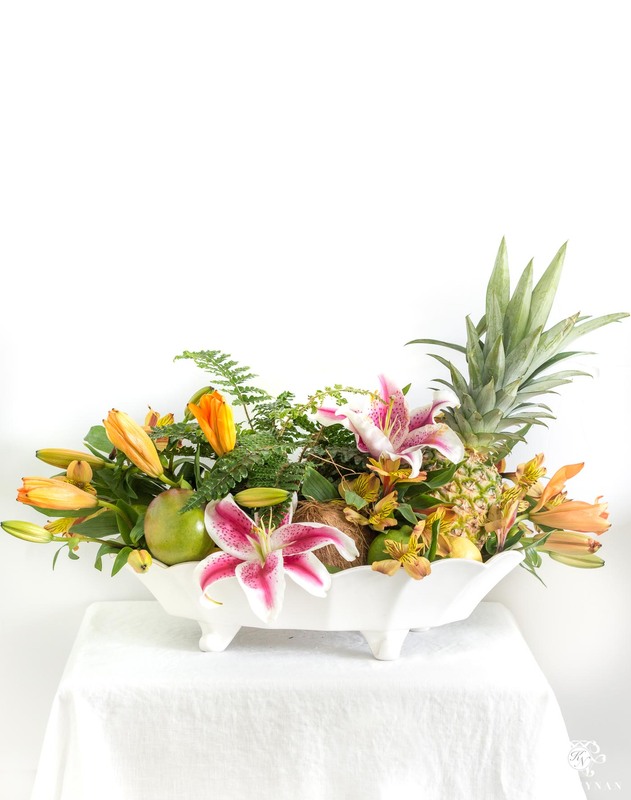 Instead of a standard arrangement, I wanted to create a “boat” of tropicality (I may have just made up a word, again haha). I started with a few large pieces- a pineapple (which I’ve since cut open and holy cow, it is the juiciest, sweetest pineapple of my life! ), coconut, a few mangos, and a small tropical fern ($7 I believe, again, from the TJ floral section). After I arranged them in the serving piece, I added several citrus fruits (lemons, limes, etc. ); lastly, I came back in and nestled in some blooms – lilies and alstroemeria. Honestly, I wish my orange lilies had started opening but because I created these arrangements the same day I purchased, they are still closed pods. PS: I love a mix of open and closed lilies but if you plan to use them in an arrangement, purchase them a few days in advance. This arrangement was the first I assembled in my head. Like #1, I love the classic feel of this – perfect for so many occasions and is a pretty budget-friendly table centerpiece. If you have any bridal/baby showers coming up, this is a great way stretch that decor budget while still having some show-stopping arrangements. 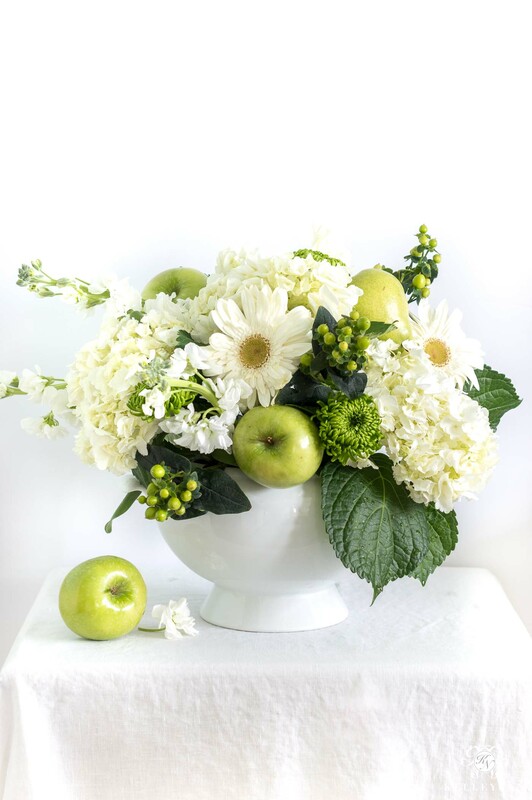 I used white hydrangeas, white gerbera daisies, white stock, green “somethings” (sorry! haha) along with green apples and pears. I added green berries as a final touch. 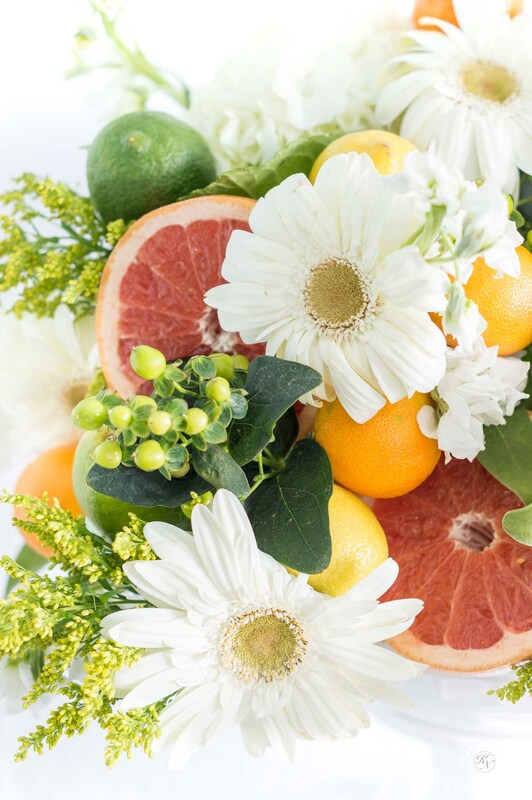 Large fruit (or veggies) take the place of big, full-sized blooms so you can get away with far fewer flowers, even in a large-scale arrangement like this one, by going for some of the bigger produce. The first uses plums and red pears – it was also when I found out how hard it was to incorporate grapes. The second arrangement didn’t use fruit in the arrangement, but in the terrarium vessel . 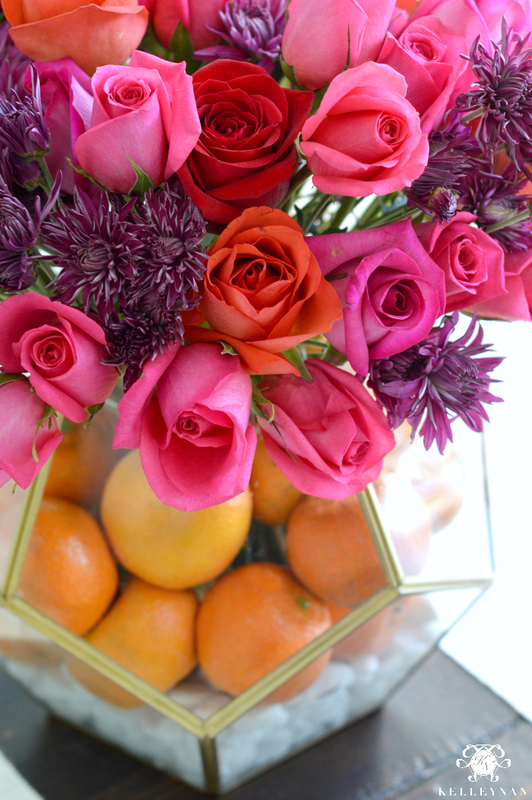 If you assemble a fruit and flower arrangement, I’d love to see what you come up with! As with any project, I love to see the end result of your efforts via email. 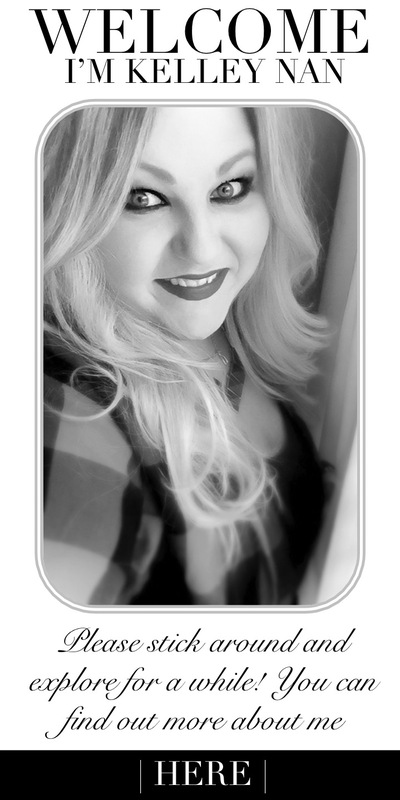 Sign up for my emails at the bottom of this post and never miss a project! Kelley, I can’t pick a favorite. Girl they are all amazing! You are a natural when it comes to arranging them too. Great vision. 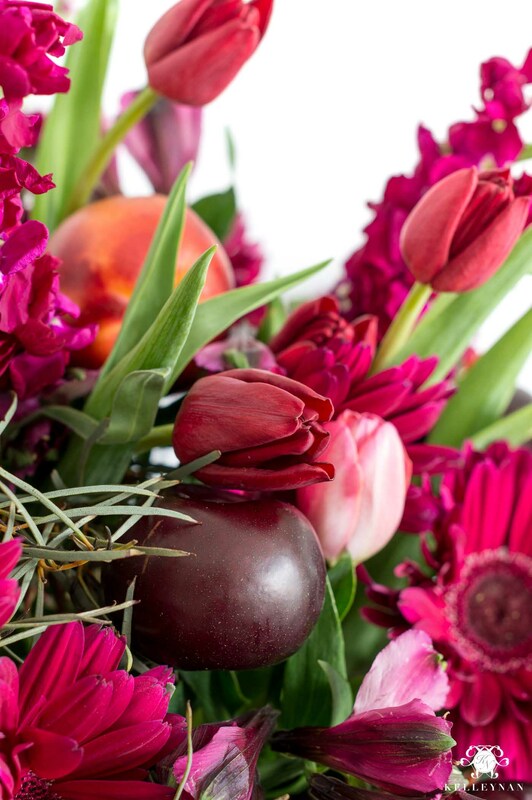 And, I had to laugh at your “grocery store” flower comment…most of the arrangements I have received from a florist last half the time the ones fresh cut from the grocery store do. Wow! you are really talented, your arrangements are very pretty and they look like you purchased them at a florist. Great job! Lauren, oh my goodness, thank you! And you are so right!!! SWOON. I am obsessed with this post. 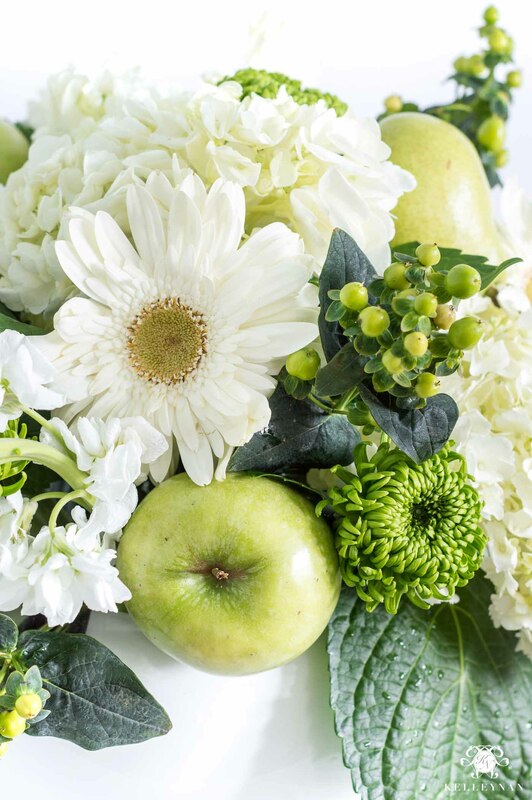 I took a floral arranging class once and we used apples in our arrangements, I haven’t mastered it quite yet on my own. your images are beyond beautiful. Outstanding Kel!! I LOVE the blue and white, of course, but number two stole my heart!! I would SO LOVE video tutorials from you!! No one does flowers like you do! Tam, thank you so much!! It was a fun (but long) day haha! 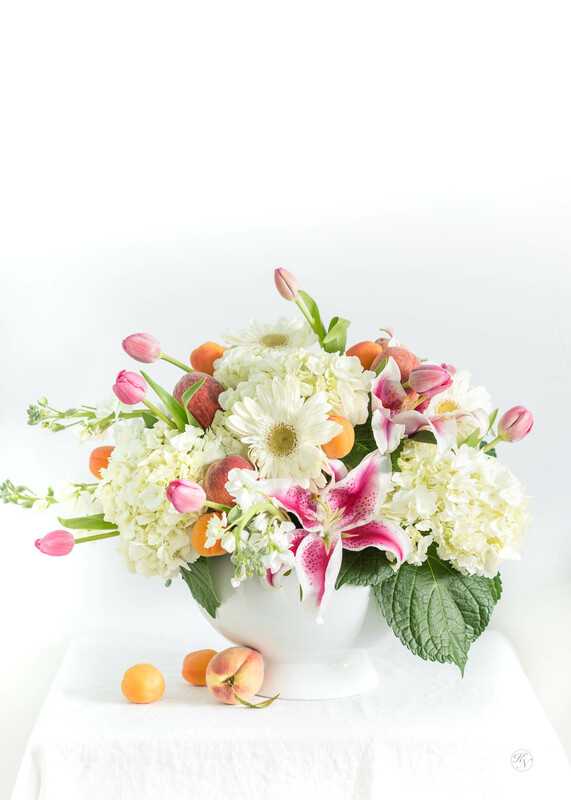 These arrangements are a feast for the eye! Karen, thank you! They were so easy to put together! These are all beautiful! Never thought to use fruits mixed in with flowers! Thank you for the tip! Lisa, let me know if you create one! Kelley, these are all beautiful! Why can’t we be neighbors? It would be so fun to create together!!!! Gosh…each one is superb! I love the tips, the vessels and the end result. You are amazing! Annette, thank you so much. Wishing you a beautiful week! They are all simply beautiful! 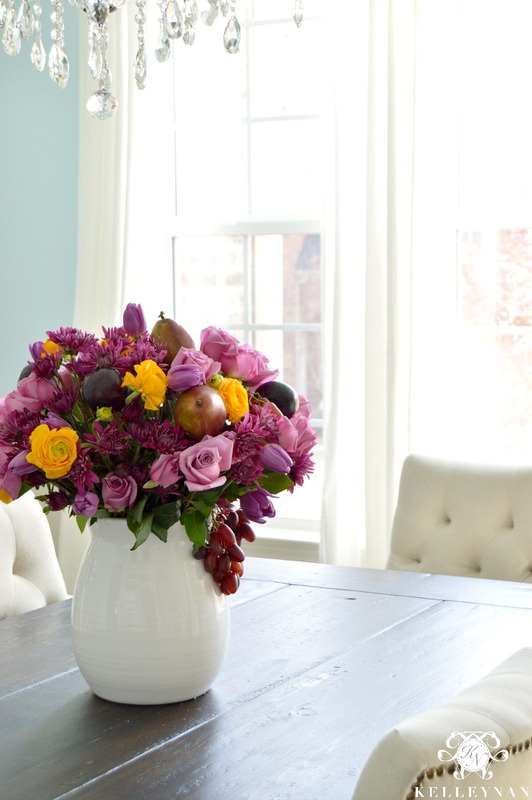 You have such a great eye for design, and that obviously includes floral design! Thanks for the inspiration! Your floral arrangements look like pieces of art. Just beautiful ! I also really like the flower selection at TJ’s and the prices are great. Mary, that is such a kind compliment- I really appreciate that! Sorry, not sorry. That Bonus arrangement is still one of my all-time favs by you, Kelley! 🙂 Just stunning! Kelley Nan, these are truly stunning!! I can’t wait to wow my family when we host Father’s Day this weekend. YAY, thank you! 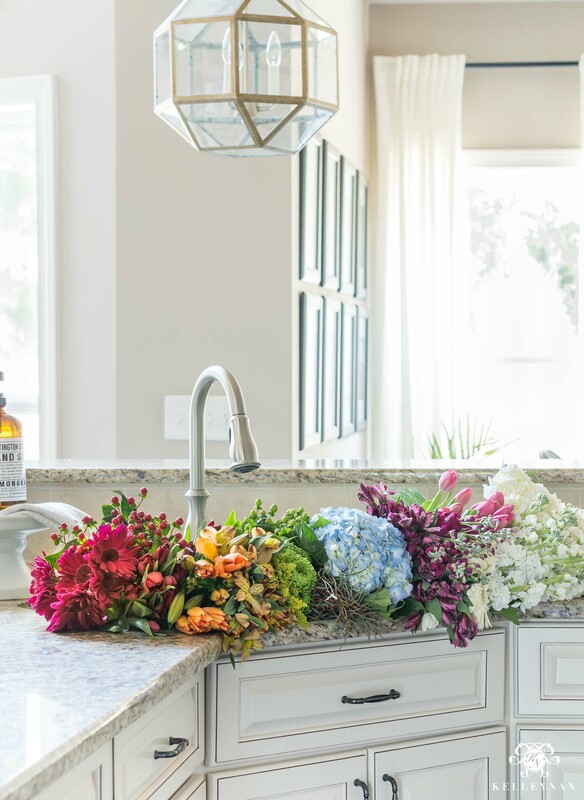 You had me at grocery store flowers because I use them all the time to make arrangements and everyone always loves them! All of these arrangements are stunning! I’m new to your post and looking forward to the next one. Love your decor! I just love it. I have never thought of mixing fruit and flowers in such a way. 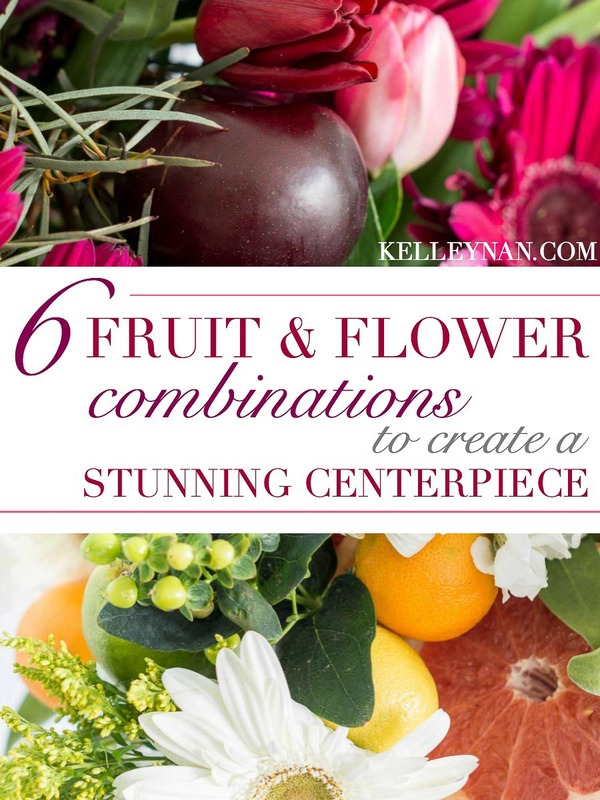 These fruit and flower arrangements with combinations are amazing. Thanks for sharing this post. Such gorgeous arrangements Kelley! I am with Randi, let’s all be neighbors so we can play with flowers all day together! Loved this post they are all so beautiful but #2 is my favorite they look like pieces of art.